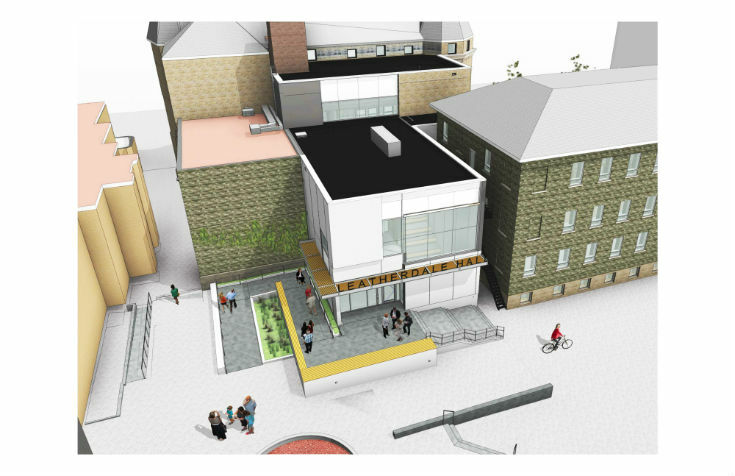 WINNIPEG, MB – The University of Winnipeg Board of Regent’s last night approved construction of a $ 4.75 million dollar addition to Wesley Hall and the Collegiate, made possible by a generous lead gift of $2.5 million from Dr. Douglas W. and Mrs. Louise Leatherdale. 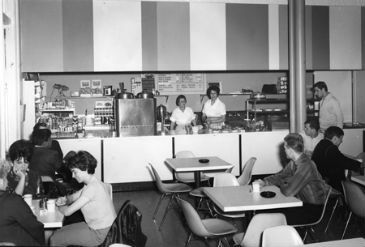 Leatherdale Hall allows for the resurrection of Tony’s Canteen, a beloved gathering space for many University of Winnipeg and Collegiate alumni. 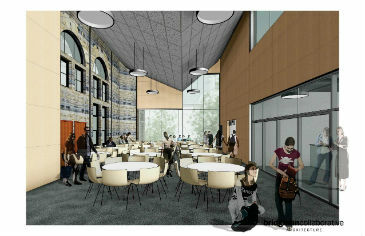 Located next to Convocation Hall and connected via a double doorway, the new flexible multi-use space can seat 150 people and be converted to a lecture hall, reception area and break-out room for conferences. The design allows for future development of a digital media hub. 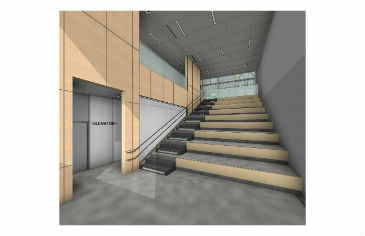 Entering Leatherdale Hall at the ground level courtyard adjacent to Sparling and Centennial Halls, an area called “The Commons” will provide tiered, bleacher-style seating for 60 people designed to support lectures and community events, including a drop-down presentation screen and technologies. The new 5,877 square foot, two-storey addition also provides improved wheelchair access to Wesley Hall. “We are pleased and honoured to be part of this exciting addition to Wesley Hall. Leatherdale Hall will be a magnificent offshoot to Convocation Hall and will become an important fixture for UWinnipeg and Collegiate students alike, much like it was in my days,” said Dr. Douglas Leatherdale. “It will also serve as a wonderful meeting place for the surrounding community and become a vibrant centre of academic life in the heart of downtown Winnipeg”. In addition to the Leatherdales’ generous gift, the University of Winnipeg Foundation has launched a $1.5 million fundraising campaign in support of the project. Led by Foundation Board Members and Campaign Co-Chairs, Dr. Jim MacDonald and Dr. Jim Richardson, the campaign has already raised $500,000. Construction of Leatherdale Hall begins in winter 2016 with completion expected by early 2017. Leatherdale Hall will also include two redeveloped classrooms for the Collegiate (high school on campus) use along with a centrally located office to serve Collegiate students. The project will comply with the University of Winnipeg Sustainable Energy Initiatives. Sustainability features will include high insulation value, triple pane window glazing to minimize heat loss/gain, low-flush toilets, LED lighting and use of natural daylight and light sensors. Selection of regional materials and natural finishes (birch, concrete, stone and glass) highlight the environmental responsiveness of the design. Acoustic panels and wood will enhance the experience for building users. The infill nature of the project and its integration into Wesley Hall adds to the density of the surrounding neighborhood. The direct link to Wesley Hall encourages the use of existing infrastructure. Project management is by The University of Winnipeg Community Renewal Corporation; the architect is Bridgman Collaborative Architecture; and construction is by Manshield Construction. Dr. Douglas W. Leatherdale ‘57, United College alumnus and wife Louise are longtime donors to The University of Winnipeg and The Collegiate. from home, this experience opened his eyes to a new world, introducing him to arts and culture, heated debates and political discussions. 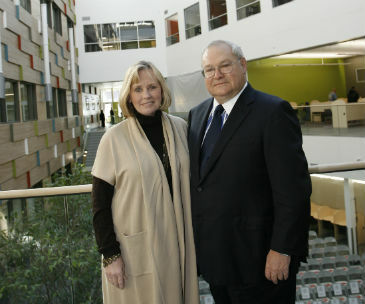 Passionate about education and inspired by their own educational experiences, to date, the couple has generously contributed more than $4.5 million towards the renewal and construction of essential campus space, student supports and a strengthened academic environment, making the Leatherdales UWinnipeg’s most generous private donors. In 2007, their donation of $500,000 drove a full restoration of Convocation Hall in time for the University’s 40th Anniversary Homecoming celebrations and earned The University of Winnipeg a Heritage Winnipeg Preservation Award of Excellence. The couple also support an endowed fund named in memory of his father who, despite never receiving a high school diploma, always encouraged his son to get an education. The Walter W. Leatherdale Scholarship covers the cost of tuition, books and partial living expenses for exceptional students from rural Manitoba and who, like Dr. Leatherdale, grew up on a farm. Additional student support was directed to the University’s Global College which received a generous contribution to establish the Dr. Douglas W. Leatherdale Global Internships. These internships provide students an opportunity to enhance their degree programs with credits they obtain through international studies in Human Rights and Global Studies. Retired Chairman, President and Chief Executive Officer of The St. Paul Companies, Dr. Leatherdale is a founding member of the University of Winnipeg Foundation’s Board of Directors. Louise Leatherdale was born in Duluth, Minnesota and is a graduate of Indiana University. She manages Leatherdale Farms, an international Hanoverian horse breeding operation. Tony’s Canteen was the central hub of life in what was then United College, a place for students and faculty to meet, work, debate, eat and to get to know each other. Named after Tony Kozyra, Tony’s Canteen was where hundreds of parties, college functions, and socials were planned at the original salmon-coloured tables in the basement of Wesley Hall. Whenever there were late-night events or students studying for exams, Tony kept the canteen open long after midnight. Tony ran the Canteen from 1936 until his passing in 1965. Carl Ridd delivered the Valedictorian Address in 1950 and placed Tony’s among the “institutions” of the College, along with the Residence common rooms, the library, and Convocation Hall: “Here is the heart of United College, where the sluggish blood is cleansed, and whence a rejuvenated student is pumped back into the bloodstream of college life.” The Canteen remained a fixture on campus until 2007. Please click here to help bring Tony’s back!